What is the Quad Cities Open Network? Quad Cities Open Network (QCON) is a collaborative of human service providers and advocates throughout the Quad Cities region working together to provide the most efficient, effective, and accessible resources for the community. QCON is committed to collaboration, coordination, choices, and community. QCON has 42 member agencies and growing, providing unique expertise and working together to improve overall services in our community. QCON member agencies compliment each other’s efforts without duplication to find unique solutions for each individual or family. QCON member agencies believe each person should choose their human service provider. All options are offered regardless of connection with QCON. QCON contributes to its community’s economic development by strengthening the workforce, improving graduation rates, reducing homelessness and making neighborhoods safe. On October 10th, at CityView Celebrations at TrimblePointe, NPR Illinois, WVIK, and AARP hosted a forum on the Illinois Budget—the last of five that have been held across the state of Illinois. 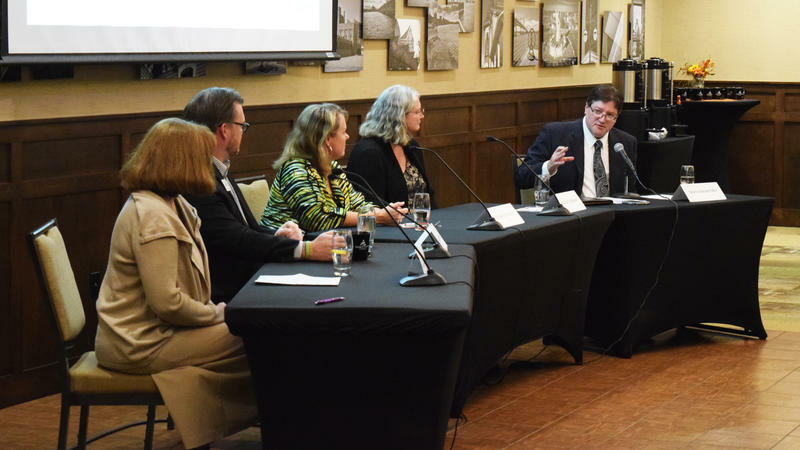 The panel included Natalie Linville-Mass – President of Media-Link, Inc., Bettie Truitt – President – Black Hawk College, and QCON’s own Kathy Weiman – CEO, Alternatives and Mark Mathews – Executive Director, Child Abuse Council. All did an outstanding job representing human services, education and business experiences and perspectives as a result of Illinois’ ongoing budget saga. In addition, members of the QCON were also in the audience supporting the event. Speaking with eloquence and passion, all panelists made the salient points that we need the decision-makers and the electorate to hear. Members of the audience then got up to make their points and ask questions of the panelists. Several identified that, sadly, they were going to be leaving the state due to the ongoing fiscal challenges of the state. Maybe that will get the attention, not only of our elected officials, but also the community at large. Well done everyone.